CES 2014 is wrapping up today, and as I was on my way out I caught sight of a rather odd-looking tablet. The EnchantMoon is an 8" Android tablet (with an electromagnetic stylus) that forgoes any recognizable interface and instead encourages you to build your own from scratch. 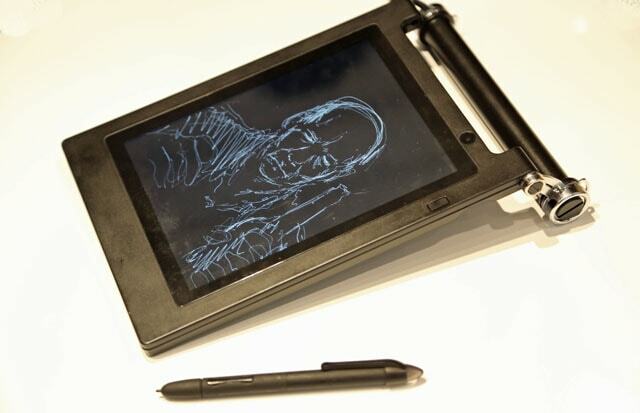 This is a handwriting tablet conceived with a stylus obsession, which means that every command is entered by writing or drawing on the screen. Want to include a photo in the note you are writing? Draw a shape and then write the word camera, and that shape will become the viewfinder for the EnchantMoon's edge facing camera. Unlike most tablets, the EnchantMoon doesn't have a rear facing camera, just one on the edge and one facing the user. Physically, the tablet is a thick, black slab. It's most noticeable feature is the heavy duty handle\foot which can be used to set the tablet vertically or prop it up like a wedge. It's rather heavy, too. This tablet launched in Japan last year (it retails for 39,800 yen or about $383 USD), where it has sold around 5,000 units. It's due in the US this Fall, and while I don't know the specs for the US model I do know that the Japanese model has a 1.2GHz CPU, 1GB RAM, 16GB of storage, and Wifi (according to one retailer). I played with it for a few minutes and I am more than a little puzzled.vPerhaps I am not artistic enough, but I don't see why one would want to spend so much in order to enable a new type of digital note-taking. On the other hand, perhaps I have been tied to a keyboard for too long; it might have blinded me to the possibilities. The Nook RT Lives. But Nook Is Dead.